The yang/yin distinction between the Kleinian object and the Lacanian symptom is the relation to a ‘more’ mediated by the way the secondary process is itself organised. The diagram used to make this distinction is the quadripod, with the understanding of ‘more’ resting upon an understanding of the object as a relation to the ‘complexification’ of  quantity. This quadripod is to be found in Lacan in the form of a reading of the structures in Freud’s Project for a Scientific Psychology , and was presented by me at an ISPSO Regional meeting in London in 2007. In what follows, a railway metaphor is used to describe its essential characteristics. In this metaphor, the traveller’s thinking about what kind of experience they would like to have is the reading. The experience itself will be an actual journey across the railway network – a what-is-going-on (wigo) – that will take place within the context of this expectation. Thus the expectation is turned into a ‘complexification’ represented by the way the traveller travels across the network. 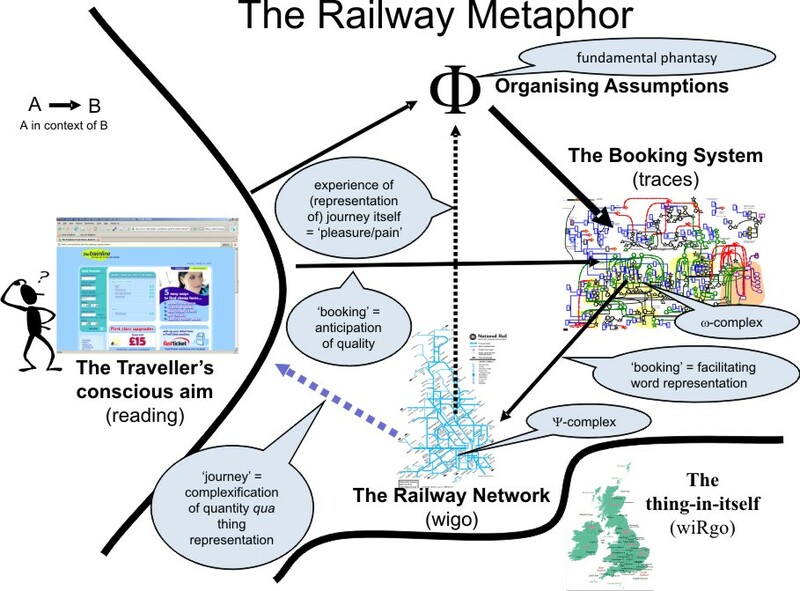 But in order to have this experience, the traveller must interact with a booking system that is based on traces of the network itself, a system that is designed under organising assumptions that shape the ways in which the booking system mediates the ways in which the network can be experienced as a particular journey across the network. 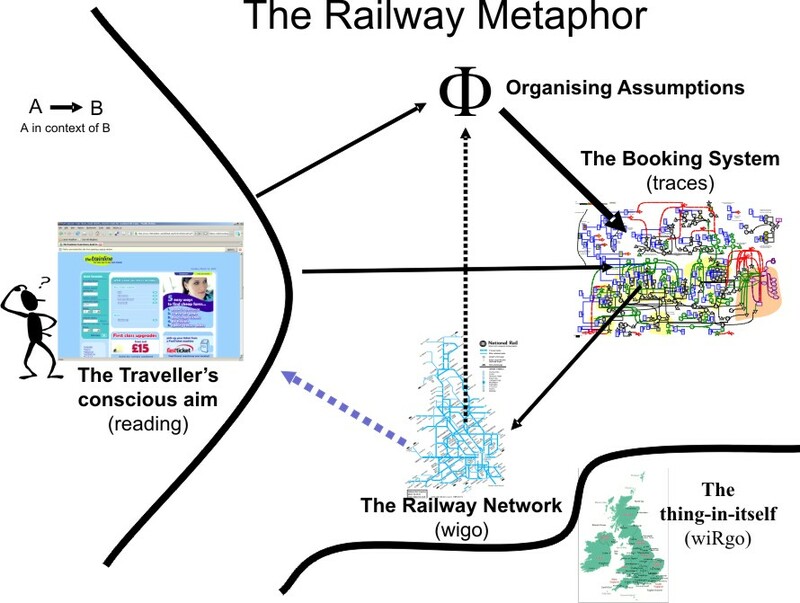 The United Kingdom is a way of representing a relationship to a ‘more’ – to a thing-in-itself – that is what-is-really-going-on (wiRgo), but which is only indirectly knowable by the traveller through their experience of the journey mediated by the railway network. If we translate this into Project terms, then the conscious reading is of traces that are supported by object-signifiers in the -system, the booking being both an anticipation of the quality of a -signature which is also a facilitation of a distribution of quantity in the -complex. All of this takes place under the organizing influence  in its undercover form of a fundamental phantasy that is the context within which the resulting distribution of pleasure/pain in the -complex is experienced. The ‘beyond’ of this experience of pleasure/pain is then the relation to the thing-in-itself qua Das Ding – the radically Other nature of wiRgo – that is the experience of the lack of the unconscious. 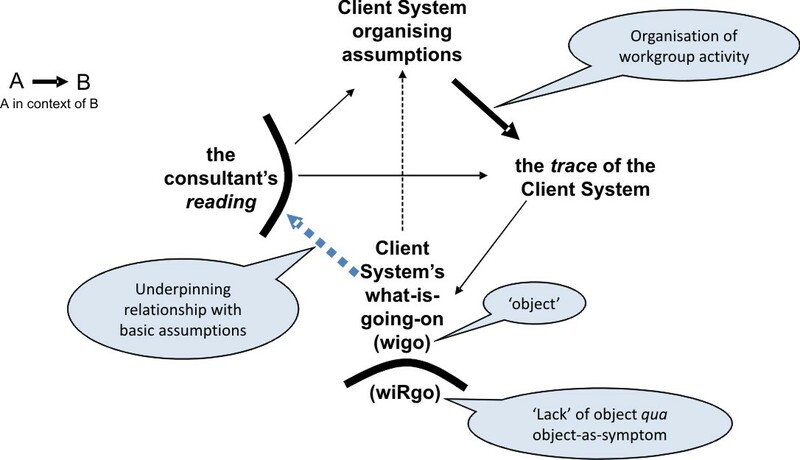 Note how the consultant’s reading (which will form the basis of their interventions) is formed with the context of the way the Client System is organised to compete. If this is not in question, then it is enough to focus on getting the consultant’s primary process ‘out of the way’ of double-loop learning (is the client doing the right things?). But if this is not the case, perhaps because of new challenges emerging in the Client’s environment, then understanding the relation between organising assumptions and symptom creates possibilities for triple-loop learning (how does the client decide what is right?). These are to be found in scientific psychology, the basic schema of the project, and the structure of a Lacanian ‘discourse’. Referring to the ways the organisation ‘knots’ itself, the endo-exo asymmetry is created with the epistemic ‘outside’ by its relation with the ontic ‘inside’ of being in relation to wiRgo. The Cartesian asymmetry is between the organising assumptions  and the truths of the -system. The Heisenberg asymmetry is between the ‘local’ -system (i.e. ‘local’ to the way the organisation understands itself), and the non-local nature of wiRgo (but nevertheless being rooted in the identifications of the organisation).